Staff Selection Commission has already released its official calendar declaring the dates of much awaited SSC exams for 2018-19. Now its high time to start preparing as this year is lined up with the most important SSC exams. Many students are facing issues on how to prepare for the exam and which books are the best to buy. With the motive of transforming your dreams into reality, ADDA247 Publications is a one stop solution to every problem or doubt you might face while preparing for these competitive exams. Our latest Publication brings out a brilliant combo of “100 Mock Tests Practice Book for SSC CGL Tier-I 2018 ” in English & Hindi Medium and ‘’20+ SSC CGL Tier II 2015-18 Previous Year’s Paper Book’’ (English & Hindi Printed Medium) to polish your practice not only for SSC CGL Tier-1 but also for CGL Tier-2 2018-19. This combo also assists you for other SSC Exams viz. SSC CPO, CHSL, MTS to make you efficient and outsmart your competitors. At just a decent price of Rs. 699 this combo is worth giving a try as it has bunches of Practice Exercises accumulating an apt study material to clear out every challenge in the real exam. Why should you buy Combo “100 Mock Tests Practice Book for SSC CGL Tier-I 2018 + ‘’20+ SSC CGL Tier II 2015-18 Previous Year’s Paper Book’’ (English & Hindi Printed Medium)? 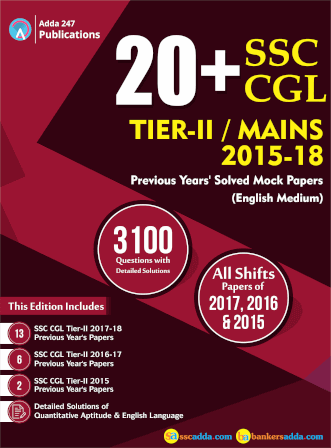 Comprising 10000 Questions of Previous Year Mocks of 2017 and 2016 with detailed solutions explained to the core to escape every single doubt and 22 Mocks of SSC-CGL Tier-I based on latest pattern developed under the guidance of experienced faculty and renown Adda247 Team, we bring to you an exclusive feature with purchase of this book by Adda247 Publications- you will also get an e-book of the same that you’ll be able to access from store.adda247.com or Adda247 App. This exclusive facility is to help our readers to stay updated by giving them an access to the latest version(s) of the book. 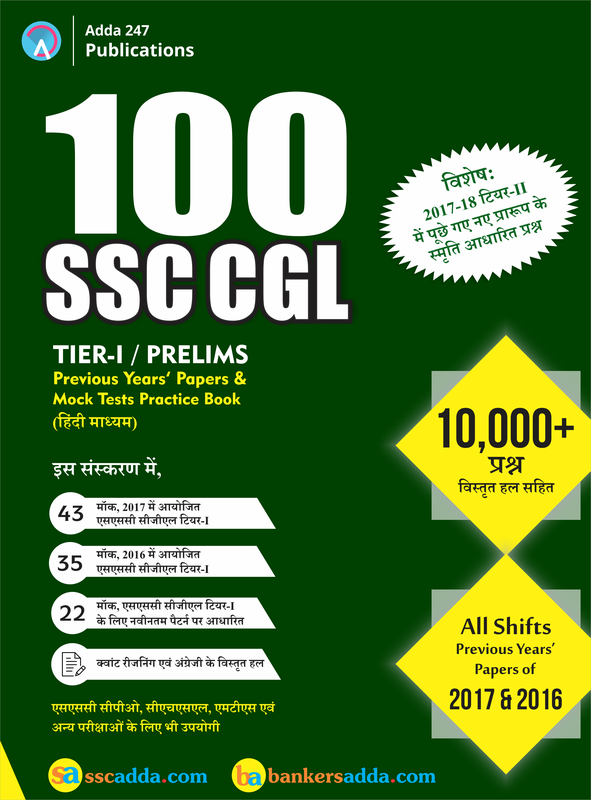 Other book ‘’20+ SSC CGL Tier II 2015-18 Previous Year’s Paper Book’’ of this beneficial Combo is encompassed with 2015-17 previous years papers and their detailed solutions in English Medium Only to make you face CGL Tier-II Exam boldly. This Book also includes re-exam paper of SSC CGL Tier-II. 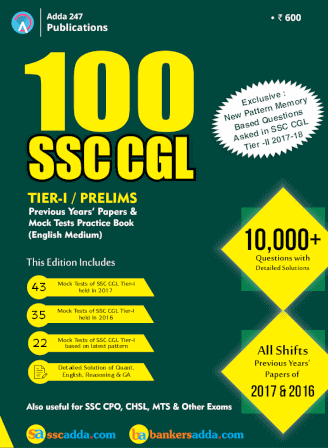 With Plethora of 3100 questions in 20+ Mocks (available in English & Hindi Medium) with detailed explanations of both sections Quantitative Aptitude and English Language, this book won’t leave a single doubt in your mind and will sharpen your skills for CGL tier-2 2018-19 as this is the appropriate time to practise for both phases of Exam. ADDA247 is leaving no stone unturned to make you hold a government job, be quick off the mark, come ahead and order the most efficient books combo which ensures your success guarantee. Note: Book will be delivered within 10-15 working days, after placing an order.